Step forward : Found a silk garden colorway (#251) that I love to go with the red (#84) I'd already chosen for my second Crocheted Noro Striped Scarf. 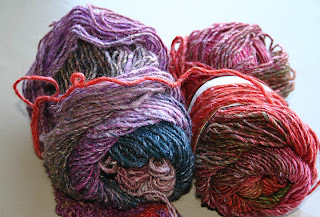 Step back: there was only 1 skein in stock. Of course. I picked two different but similar colorways (#205 and 251) to get this project back on track. Step forward: Finished two body sections on my Cozy Cabin jacket before class tonight. Step back: Yeah. The wrong sections. See that big empty space to the left of my needles? I had almost all 80 rows done before realizing that's the hole where the sleeve goes. Riiiiiiipped it back and started again, one section over. 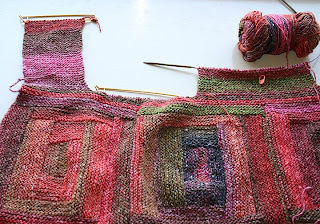 Step forward: I only have to knit three of these sections, not five as I previously thought. So even after ripping out an entire day's work, I feel like I'm coming out ahead. Bonus: Still loving these colors. Mr. Noro is a genius.